L'Oreal Professionel Hair Spa Day at Nadia Hussain Salon! On 22nd September, 2014 - L'Oreal Professionel hosted a Hair Spa Day in collaboration with Nadia Husaain Salon and clinic, attended by an array of editors, bloggers and socialites. Two of L'Oreal Professionel Hair Care lines were highlighted at the event. : Serie Expert and Mythic Oil. For L'Oreal Professionel Hair Spa Day there were five luxury treatments available: Pro-Keratin Refill, Lissceutic, Absolute Repair Lipidum, Fiberceutic and Mythic Oil. 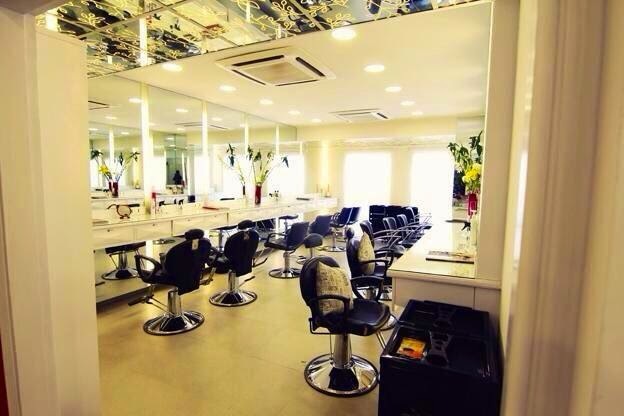 Nadia Hussain Salon is located amidst the food & beauty street in Clifton. The salon & clinic stand out on that street, because of it's red colored exterior. After the bright exterior, the interior didn't fail to awe me either with the luxurious and welcoming ambiance. The salon is clean, hygienic, relaxing; a place that will calm your stressed senses. It's not just a salon and a clinic, but a boutique too. As I entered, I was warmly greeted by the team L'Oreal Professionel, Lane 12 & Nadia Hussain herself. I was immediately taken for the hair consultation, where Nadia checked my hair & asked a few questions before suggesting "Lissceutic" treatment for my damaged and frizzy hair. The treatment is somewhat like Fiberceutic, but a little different in the application process and obviously the products. The process was: wash, condition, apply the Lissceutic treatment mask and leave it on for 15-20 mins. Meanwhile, I enjoyed a cup of coffee and a foot massage which was very relaxing. Also, Nadia kept coming and checking if any of us needed anything and if we were enjoying. After 15-20 minutes, I was taken for the hair wash, followed by a paddle blow dry, as you can see in the picture. I could actually feel my hair softer, volumized and manageable. The treatment lasts for 1-2 washes. It's good for a fast boost to your hair. Did I notice a visible difference? Not really, my hair were soft but not a big change if I compare it with Fiberceutic treatment. Maybe a few more sittings might show a result or maybe it's a one time booster. It was a great experience meeting Nadia in person, she is a sweet and GORGEOUS lady. Also, a great experience at her salon. Definitely looking forward to going back to the salon for some pampering. Definitely for the manicure and pedicure, which looked so relaxing and clean. Do check Nadia Hussain Salon Facebook page for any queries. Also, L'Oreal Professionel Facebook Page for new product launches. Have you ever been to NH Salon? Did you every get any L'Oreal Professionel hair treatment done? If yes, which one & your experience? Pictures courtesy: L'Oreal Professionel & Nadia Hussain Salon. Nadia hussain is such a beauty.